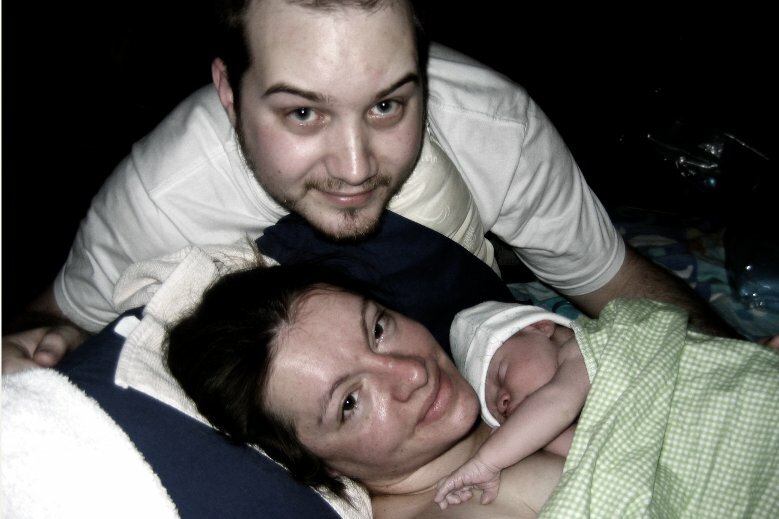 I used Hypnobirthing to prepare for my first birth. I was so excited about birthing at home in Los Angeles, California! 6 days past my adjusted (several times) guess date we welcomed our first baby into this world on January 13, 2009. It was a Tuesday and I woke up and went for a swim. I loved swimming during this pregnancy, it felt so good! I came home after an hour in the pool and decided that scrubbing the tub was essential. Right after I finished I began to feel my first pressure waves around 1:15 pm. I jumped in the shower so I could rinse off the pool before things got too intense. While in the shower I had more pressure waves and began to get excited, I was going to meet my baby soon! I told my mother, who was living with me at the time, to call my husband, doula, and midwife. I bounced on the birth ball while we timed birthing waves. Within an hour I was 5-7 minutes apart and hated the birth ball. My doula arrived and helped me get comfortable on the toilet. I loved the toilet!!! It felt so comfortable and easy to relax on. I held onto the sides of the toilet during waves and it felt so easy to stay relaxed and calm. My husband arrived soon after this. I loved knowing he was near and kept asking him to kiss or touch me. I kept telling my midwives during the pregnancy that I was going to have a short birthing time, but they never really believed me. Around 3.5 hrs into things I began to have natural urges to push that I could not stop; my body did this all on its own. My doula, possibly out of fear, told me to stop pushing because the midwives weren’t there yet. I really believe in hindsight that this was the point that made my birth more difficult. I stopped listening to my body and began to listen to what my doula and midwives said. BIG mistake. My midwives showed up at 4 hours in. They did a vaginal check and I was fully dilated. Needless to say they were shocked! I was very calm and quiet. My midwife said I could push whenever I wanted. However, my body had stopped these deep urges and was slowing down, although I stayed fully dilated. I got into the birth pool and laboured there for 2 hours. The water felt great and I even did some belly dancing. I kissed my husband and talked calmly in between birthing waves. I remember telling my midwives where some almond butter was and them laughing at how clear and calm I sounded. I did have a sense of feeling like I was in a fish bowl. I had my husband, mother, doula, midwife, student midwife, medical assistant, and dog to witness this birth! It was crowded in our condo and I felt over-watched. This was one of the reasons I decided to not have any video or photos taken of the birth. In hindsight I regret not having any pictures from my first birth experience, yet I know at the time it was the right decision. After two hours the midwives wanted me to get out of the pool to use the bathroom and see if walking around helped. I was being coached to push the whole time and felt very uncomfortable. No pain, just a general sense of unease and pressure. The longer the pushing went on the more I felt like my body didn’t know what to do. After trying to walk down the hallway, which I hated, and trying to go to the bathroom when nothing would come, I did not want to get back in the pool. I got set up on a futon that was next to the birth pool. The midwives suggested a catheter to see if that would help give baby more room to get out. We did this, however there was no urine so it didn’t help. I was exhausted and just wanted a break. But the midwives urged me to push harder. Everyone kept encouraging me to reach down and touch my baby’s head as it crowned. I was so scared and believe now I had a panic attack at this point. I did some breathing and told my husband, “I can’t do this, its your turn.” He was right there holding on to me telling me how awesome I was and that he knew I could do it. Everyone else joined in too, but it somehow didn’t feel as sincere. It felt more like they were concerned and wanted me to get baby out now. I pushed for a total of 3 hours!!! The tissue began to swell around my baby’s head. I remember the midwife looking at her watch and saying “we are reaching our limit”. I did not want to transfer if I did not have to! She said I had a small lip of skin that was in the way of his head coming all the way out (not to mention how swollen I was). She asked if I would be willing to have an episiotomy. This was exactly what I did not want, but I was tired and did not want to transfer to the hospital. I consented and was so scared about how much they were messing with my baby’s head during the process. I finally put my hands down and felt his hairy head, it was amazing to connect to my baby! I wish I could have done this sooner! A few pushes after touching him, baby Keian was earth side at 7:52 pm (6 hours and 45 minutes of birthing time!). He weighed 8 pounds and was 20. 5 inches. He had a massive cone head from being jammed in the birth canal so long, but this went away within a few days. He was placed immediately on my chest and stayed there for a few hours. The student midwife started to massage my stomach… OUCH does not even cover this! The midwife slapped her hands away and told her we don’t do that at homebirths. My birth was pain-free, but this was NOT. The placenta was birthed around 32 minutes after the baby. We clamped and cut the cord after 22 minutes. He was very limp and grayish in color so they suctioned him and gave him a bit of air. He was slow to cry but when he did it was loud! He was very fussy as I imagine he had a whole body ache from his birth experience. He was not keen on nursing and every bit of advice I was given was to shove him on the breast, which again in hindsight made things worse. We ended up giving him some sugar water with a syringe and began the long process of finger feeding him expressed colostrum for the next five days. He latched in the middle of the 5th night and I cried 🙂 I am so grateful to Keian for making me a mother and proud of myself for being able to birth him at home.